STIB implemented an eco-driving programme for its bus fleet. This involved equipping the buses with a display indicator, which gives drivers information about their driving behaviour in ‘real time’ to help them improve their driving style. The visual and auditory signals ensure the drivers stay focused on speeding, over-revving, brutal acceleration, sudden braking and excessive idling. It drastically reduces instances of abnormal behaviour for each driver, resulting in a reduction in fuel consumption, increasing the efficiency of drivers, improving passenger comfort, reducing wear in parts and lowering CO2 emissions. All events related to the vehicle and driver are stored in the onboard computer and sent to a hosted server through the GPRS network. 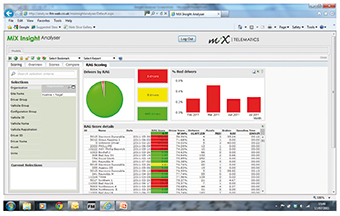 A web application provides access to data on the vehicle and driver, for the purpose of analysis. During the pilot phase, STIB succeeded in reducing the bus fleet consumption by 5%. Deployed on the whole bus fleet, this could result to fuel savings of around €750,000. Based on these preliminary results, the payback time of investing in ecodriving equipment and training is around two years.